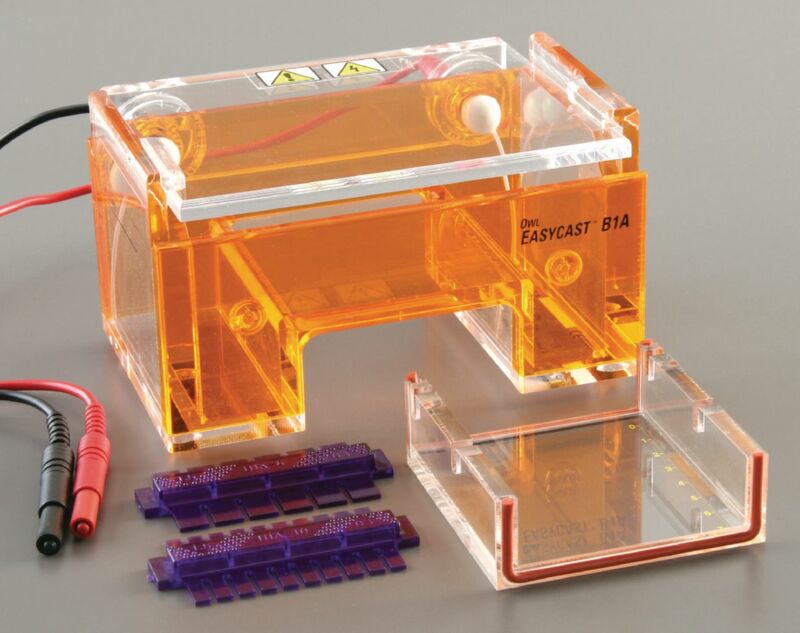 For flat, even banding patterns, this horizontal minigel system allows you to cast and run gels in the same chamber. A buffer chamber features lane visualization strips, which are silkscreened on the platform to provide a clear view of sample wells. Lane markers and fluorescent rulers provide accurate fragment size determination of DNA when compared to known standards. Leak-resistant, gasketed UVT trays allow tapefree casting in the buffer chamber. Trays also allow viewing DNA bands on a transilluminator without removing the gel. Two comb positions allow two series of samples to be run at the same time, and heavy duty one-piece combs eliminate the need for assembly. Designed for durability and safety, the system features a tight fitting lid to prevent shock and a 3' power cord. Gel size: 8"L x 7"W. Buffer capacity: 400 mL. Size: 16"L x 9 1/2"W x 8"H.